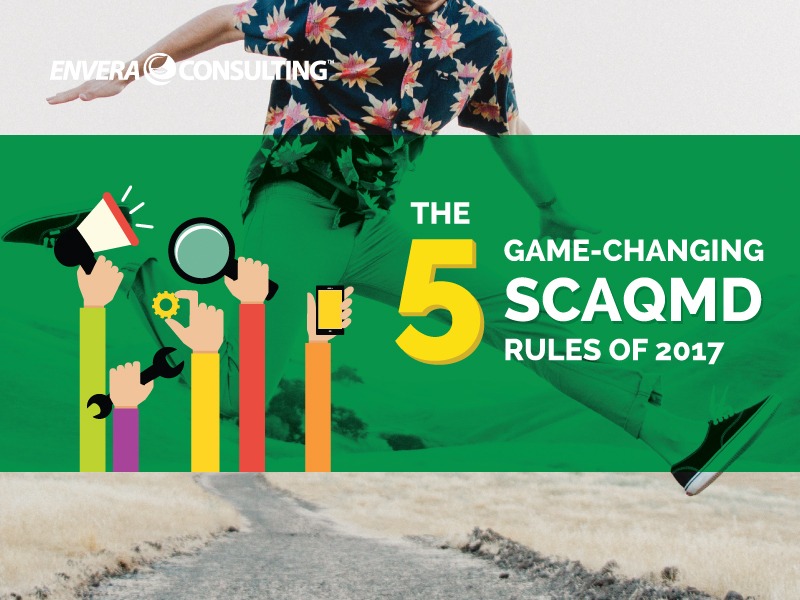 With the start of 2018, I’d like to look back at some of the significant changes to the SCAQMD’s rules over the past year. Rule changes can have significant impacts to facilities, since complying with a new or amended rule can require purchasing new equipment, changing material formulation, or even changing existing work practices (more on that here). And given what is at stake when a rule changes or a new one is added, it’s best to be active in the rulemaking process. 2017 proved to be an interesting year for new and amended regulations. One new rule requires the large-scale ambient monitoring of air pollutants, while other rules were the direct result of the SCAQMD’s ongoing monitoring in the City of Paramount. So let’s run down this list of the five game-changing rules of 2017. Rule 1180 requires refineries that process more than 40,000 BPD (barrels per day) of crude oil to install and maintain a real-time air-quality monitoring system to collect data around their fenceline. Under this rule, eight Southern California refineries will have to develop a system to collect real-time data for emissions of criteria pollutants (specifically SO2 and NOx) and a handful of toxic air pollutants (such as formaldehyde and ammonia). The refineries will be required to make the data available to the public via the web and have outreach programs to explain the data. Read the SCAQMD press release announcing the requirement. While this rule was implemented pursuant to Health and Safety Code §42705.6 — which requires districts to install community air-monitoring systems and refineries to install fenceline-monitoring systems — it’s quite obvious that this rule came about due to ongoing discussions about refinery safety in the South Bay. The development of Rule 1180 was arguably also influenced by similar rules enacted by the federal EPA and Bay Area AQMD (BAAQMD). The EPA requires major-source petroleum refineries to monitor their emissions of benzene pursuant to 40 CFR §63.658. The BAAQMD requires petroleum refineries (and support facilities) to monitor emissions of benzene, toluene, ethylbenzene, and xylenes (collectively known as BTEX). The BAAQMD rule also requires facilities to consider monitoring SO2, alkanes, 1,3-butadiene, and ammonia, among other pollutants. But the SCAQMD opted to go beyond the pollutants covered by the BAAQMD’s Rule 12-15. The agency based its decision on a study conducted by the Office of Environmental Health Hazzard Assessment (OEHHA), which detailed the pollutants most commonly emitted by refineries and which had the highest toxicity. Rule 1180 also provides refineries with the option to opt-out of monitoring specific pollutants that are unlikely to be measured at or above the detection limit of the monitoring equipment. Why It’s a Game Changer: This is the first time the SCAQMD has implemented a large-scale ambient monitoring program, let alone the first time that real-time monitoring is being used for anything other than determining compliance — in this case, public consumption. This is key because it sets a precedent for other industries. Don’t be surprised if we see more large-scale ambient monitoring programs in the near future. The data might also be used to more accurately calculate total emissions. Current emission inventories may be over- or under-reporting actual emissions, which could lead to amendments to current regulations. Rule 1147 requires miscellaneous sources of NOx to meet certain emission requirements. Since its adoption in 2008, this rule has been a contentious one for industry to digest — especially for smaller facilities. In May 2017, the SCAQMD amended Rule 1147 to allow “relief” for several different areas. Most notably, the amended rule removed the requirement to comply with the NOx emission limits for units with a heat input rating of less than 325,000 Btu/hr. Rule 1147 also completely removed food ovens from the rule and instead made them subject to Rule 1153.1. The NOx limits for afterburners, burn-off ovens, incinerators, and related equipment was also significantly increased, from 30 to 60 PPM. Why It’s a Game Changer: Rule 1147 carved out an exemption for “small” burners based on the industry’s feedback. (Read more about how that came about in last week’s post.) It’s also the second time that the SCAQMD has amended a rule based on the current state of NOx technology, with the first being for amendments to Rule 1111 in 2009. Both instances demonstrate the SCAQMD’s willingness to understand current technologies, which allows them to set more realistic emission limits and compliance schedules. In May 2017, the SCAQMD amended Rule 219 to include changes to 21 types of equipment. In some cases, this happened because the exemption requirements were made more lenient, while in others, the rule added new equipment to the list of current exemptions. Why It’s a Game Changer: The Rule 219 amendment added to and removed from the list of equipment that is exempt from permitting. Personally, anytime Rule 219 is amended, I see it as a big deal, given the role this rule plays in the permit-applicability process. Rule 1430 was passed in direct response to public complaints regarding a burning metallic odor in the City of Paramount. Through ongoing investigations, the SCAQMD identified that the odors were primarily related to metal-grinding operations at various facilities in the city. At the time, metal-grinding and -cutting operations were exempt from permits and the operations were largely unregulated. One of the various requirements of Rule 1430 is that cutting operations must be moved to a permitted enclosure and meet a specific emission limit. The rule also has various housekeeping, maintenance, and testing requirements. Why It’s a Game Changer: Although there have been similar cases, this may be the first time that the SCAQMD has created a rule to address emissions after investigating public complaints about odor. The investigation consisted of using air monitors to determine the cause of the odor, to which the SCAQMD found elevated levels of nickel and hexavalent chromium. There are a few rules in the SCAQMD that have far-reaching impacts, and Rule 1168 definitely falls into that category. The rule establishes VOC (volatile organic compounds) emission requirements for adhesives, adhesive primers, sealants, and sealant primers that are used during the manufacturing and use of consumer products (think glues used in floor and wall coverings, roofing, and plastic welding). Why It’s a Game Changer: Not only has the SCAQMD been working on amending this rule since 2012, but the ubiquity of these materials means that some facilities will need to consider new, rule-compliant materials for their processes.